The term sleep disordered breathing (SDB) includes several sleep related breathing abnormalities including snoring, Obstructive Sleep Apnea (OSA), Central Sleep Apnea, Mixed Sleep Apnea, and Clenching and Grinding (Bruxism). Snoring is the partial obstruction of the upper airways causing noise and vibration produced by the oropharyngeal muscles during sleep. Basically it is a large volume of air trying to pass through a narrowed space. Simple snoring is vibration through the soft palate (mouth snoring). THIS IS EASIEST TO ADDRESS. You can stop snoring once you breathe through your nose. High upper airway resistance (HUAR) is turbulent airflow in the nasopharynx and oropharynx causing inspiratory flow limitation (snoring through the nose). This is more common. The nose needs to be decongested and breathing levels need to be reduced to a normal level. Airway blockage. Image courtesy Wikimedia Commons. The next progression after loud snoring is sleep apnea. In fact one half half of those who snore loudly have sleep apnea. Sleep apnea affects more than 18 million Americans, according to the National Sleep Foundation. Most people are completely unaware that they have sleep apnea and are undiagnosed or untreated. Left untreated, apnea can lead to high blood pressure, memory problems, impotence, cardiovascular disease, and drowsy driving! This is the most common of the three. Holding the breath from collapse of the upper airway during sleep. During sleep throat muscles relax allowing the tongue and fatty tissues of the throat to fall back into the airways and block airflow. Once a breath is taken the brain returns to sleep, and the process begins all over again. During an apnea event air is restricted and there is reduced blood flow to the brain. This reduced flow tells the brain to partially awaken and to breathe. This is usually followed by a loud gasping, choking or snorting sound as the chest heaves the diaphragm moves down and the airways close. More than 5 times an hour is significant. Holding the breath for one minute can drop 02 levels down to 50%. Airway is not blocked, but the brain fails to signal the muscles to breathe. Brain sends signals to the body to stop breathing. It affects about 5 % of people. 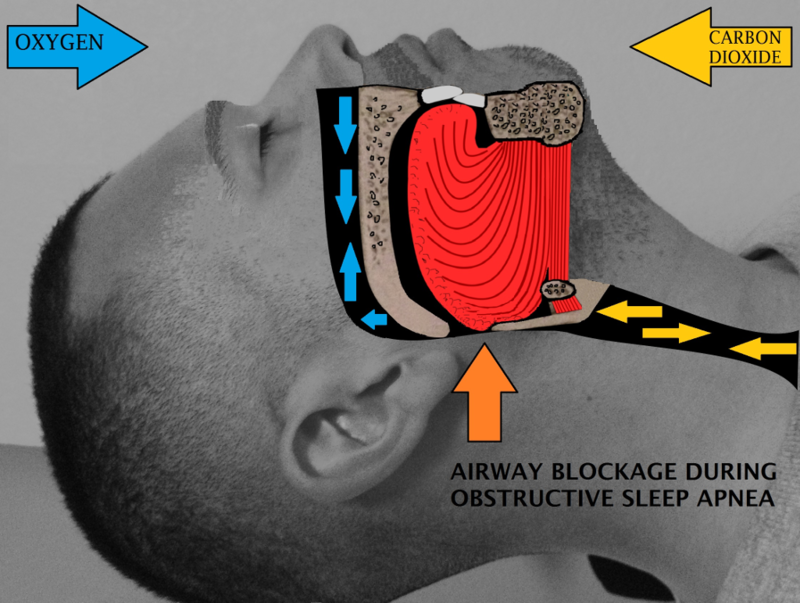 A combination of both obstructive and sleep apnea. Mild OSA: 5-14 episodes of interruptions in breathing in an hour. Bathroom at night-heavy breathing (mouth is open): we believe that the body is unable to produce its natural antidiuretic due to hyperventilation. Apnea prevents you from going into deep sleep. Never reach stage 4. Normal breathing is LIGHT, QUIET, and EFFORTLESS! The fine hairs in the nostrils should barely move. Normal Breathing is 4-6 liters of air per minute during rest! Asthmatics have a rate of 13-15 liters of air per minute during rest. Sleep Apnea sufferers have a rate of at least 15 liters of air per minute during rest. **If breathing volume is brought towards normal, negative pressure is reduced and apneas reduce. The Buteyko breathing Method is one way to achieve this. Recent research has shown that Myofunctional Therapy decreases apnea-hypopnea index by approximately 50% in adults and 62% in children. Lowest oxygen saturations, snoring, and sleepiness outcomes improve in adults. Myofunctional therapy could serve as an adjunct to other obstructive sleep apnea treatments.